Carol Ring is the CEO and Founder of The Culture Connection. Through speaking engagements, workshops and writing, Carol teaches leaders how to develop a strong, vibrant company culture that is vision-guided and values-driven. She offers her “Ignite Your Culture” program to help leaders energize their organization’s values and fuel bottom-line results. Previously, Carol worked in corporate Canada for more than 25 years. Starting as a junior accountant she eventually rose to the highest levels of corporate leadership and was voted one of Canada’s most powerful women. With a last name like Ring, it’s not surprising that Carol spent several decades working in the telecommunications industry. At Rogers Communications, she moved from the financial area into operations, overseeing several cable divisions including Rogers’s largest one in the Greater Toronto Area. As the Regional President for the GTA, she was responsible for one of the top 15 telecommunications markets in North America and its billion-dollar portfolio. Carol leveraged her wealth of senior business experience and brought the link between leadership values and organizational performance to life. Program participants were inspired and provided with real take-aways. Throughout her career, Carol has filled pivotal roles in innovative product launches, acquisitions and corporate restructuring. She has seen first-hand both the good and the bad about corporate cultures’ impact on bottom-line results. Today as a certified Cultural Transformation Tool consultant of the Barrett Values Centre she is a passionate supporter of its mission to build a worldwide network of change agents committed to cultural transformation. 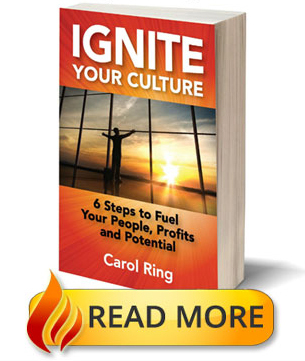 “Ignite Your Culture: 6 Steps to Fuel Your People, Profits, and Potential” is Carol’s second book. She was the co-author of “Awakening the Workplace: Volume 2,” and has published a number of articles including Integrated Life, Technology Overload, and Boomerang Think. Carol has been recognized by her peers and received numerous honours. She was awarded the Fellow of the Society of Management Accountants, a prestigious national designation awarded to Certified Management Accountants for their excellence in management accounting, commitment to CMA Canada, and demonstrated civic mindedness. In 2008, Carol was recognized by the Women’s Executive Network as one of Canada’s Top 100 Most Powerful Women. In 2011, Canadian Women in Communications announced Carol as their Woman of the Year. Using the combination of personal anecdotes and valuable lessons learned from your wealth of experience, you delivered precisely the type of advice and wisdom we strive to provide our guests. In addition to her work in the corporate world, Carol is actively involved in the community. She is a Past President of the Board of Governors for Certified Management Accountants of Ontario, and served on the National Board of CMA Canada. Additionally, she is a past Chair of the Greater Ottawa Chamber of Commerce and served on the boards of the Royal Ottawa Health Care Group, Canadian Women in Communications and the Merry-Go-Round Children’s Foundation. 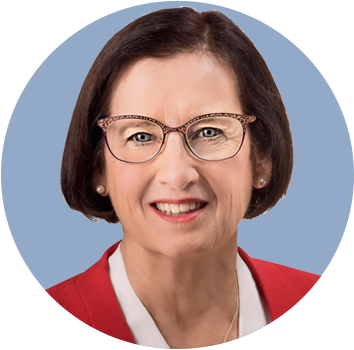 Carol has served on both the Toronto and Ottawa boards of the Canadian Association of Professional Speakers.